44964: 14-17 Toyota Tundra (All Models except 1794 Edition) Sport Series Chrome Formed Mesh Grille Insert (with black logo bar). 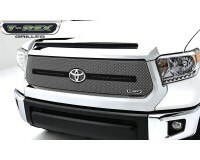 Upgrade your Tundra with this sporty looking chrome sport mesh grille insert. Made from high quality aluminum mesh, this custom grille is uniquely formed for a 3D affect (not just flat mesh) and comes finished in sparkling triple plate chrome. Comes in one piece and replaces the OE factory grille insert. Included is a powder coated black accent with an area for the Toyota logo. (Original Toyota logo is removed from OEM grille and re-used.) Comes complete with hardware and installation instructions. Installation time is about 1hr. and can be done with regular home tools. Matching chrome hood accent grille and bumper grille is also available above as an optional items. Backed by manufacturers 5yr warranty. Made in USA. Tell your friends about the Sport Series Formed Mesh Grille Insert (Chrome) (With Black Logo Bar). Share this product on Facebook, Twitter, MySpace or send an email to a friend!